The world has seen some unusual Pepsi flavors. But the reigning champ for variety and inventiveness is still Japan. Earlier this week, Kotaku reported that Pepsi Pink, a strawberry and milk flavored drink, will soon be available in Japan. That beverage, however, is just the tip of the iceberg. Like Doritos, there is a wide spectrum of Pepsi that has been sold in Japan over the years. The reason why there are so many flavors is that food and drink makers in Japan continually roll out a variety of new tastes, some of which are offbeat, in hopes of grabbing consumers' attention. Some of the snack type flavors you see in Japan appear as quickly as they disappear, and you can't help but think that the companies put out certain flavors just to stand out or create a stir. Most of these drinks you can no longer get. Some are collecting dust on store shelves as we speak. But let's have a look at some of the standouts. Pepsi Red went on sale for a limited time in 2006. As you can see in this Gigazine photo, the "spicy" tasting soda was, well, red. Pepsi Gold hit Japan in 2006 for a limited time. It was ginger flavored. 2007 saw Pepsi Ice Cucumber for a limited time. Thankfully. This was, in my opinion, a truly horrid drink that didn't taste like cucumbers, but tasted like awful. Some people liked it though. The Pepsi Blue Hawaii was launched in Japan in 2008 for a limited time. The blue fizzy drink tastes like pineapple and lemon. Then, there was Pepsi White, which tasted like Pepsi and yogurt. It launched in 2008 for a limited time and relaunched for Winter 2012. This is "Pepsi Azuki." Like as in the beans. It went on sale in 2009 for a limited time. Here is what the actual drink looked like. Shiso is a herb that often appears in Japanese cuisine. Pepsi Shiso was released for a limited time in 2009. While it looked like mouthwash, I thought it tasted okay. Then again, I love shiso. Mouthwash is good, too. Pepsi Baobab was released in 2010 for a limited time. While the label featured baobab trees, the drink apparently tasted more like ginger ale—or better yet, "refreshing cola flavor." Going on sale in 2010, Pepsi Strong Shot had more caffeine that regular Pepsi. Interestingly, the highly carbonated beverage even had a warning label that recommended waiting 15 seconds after opening the can to take a sip. Pepsi Nex, a zero calorie Pepsi, was launched in Japan in 2010. In 2010, Pepsi Mont Blanc went on sale for a limited time. It had a creamy chestnut flavor, evoking the dessert that inspired it. The drink had its fans. Apparently. Pepsi Dry, a "non-sweet cola," went on sale in 2011. Pepsi Caribbean Gold was released in 2011 and had a "white sapote flavor." Once again, a yellow drink. Pepsi has released several energy colas in Japan, but the Darth Vader one, which says, "Give yourself to the dark side," was the best. Here is the non-Vader can. This is Pepsi Special. It went on sale in 2012 and, as previously mentioned, contains a dietary fiber supplement and makes it difficult for the body to absorb fat while eating. The beverage is still on sale. Pepsi Salty Watermelon billed itself as a "refreshing taste of summer" when it went on sale in 2012 for a limited time. In Japan, some people do put salt on watermelon to bring out the flavor, so the taste wasn't that peculiar. It was actually pretty good. Pepsi Black (with lemon!) was the 2012 follow-up to Pepsi Dry. Once again, it looked like Pepsi. And as mentioned above, this year will see Pepsi Pink relaunch in Japan for a limited time. Originally going on sale in 2011, the drink is sweet and flavored kind of like strawberry and milk. 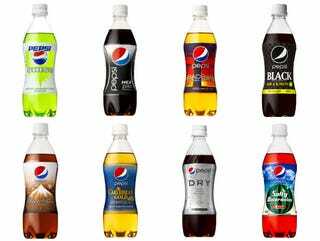 Can't wait for what Pepsi flavors 2015 brings!